Transform your Living Room into an Art Gallery! If you're passionate about art, it’s no wonder that you want to make an art gallery out of your living room. When displayed with creativity and innovation, artworks can completely transform the aesthetic charm and visual interest of a room. And they speak volumes about who you are and the myriad shades of your personality! Hanging paintings is not just about drilling a few holes in the wall and putting the frames up. It needs a lot more attention and an eye for detail. You need to know how to arrange and highlight the wall arts so that your guests notice the palpably artistic mood of the living room in an instant. It is also crucial to understand how well a set of paintings goes with a particular style of home decor. The colour of your wall, and the type of furniture are among the other factors which need consideration when you want to create a wall of art. So here are some ideas which can make your personal art gallery rock! The trick behind a successful living room art gallery is the use of focused lighting. Check out the living and dining area pictured above to understand what we mean. The recessed lights on the ceiling are positioned over the wall arts in a way which draws our attention to them effortlessly. Focused lights on the wall can achieve a similar impact too. 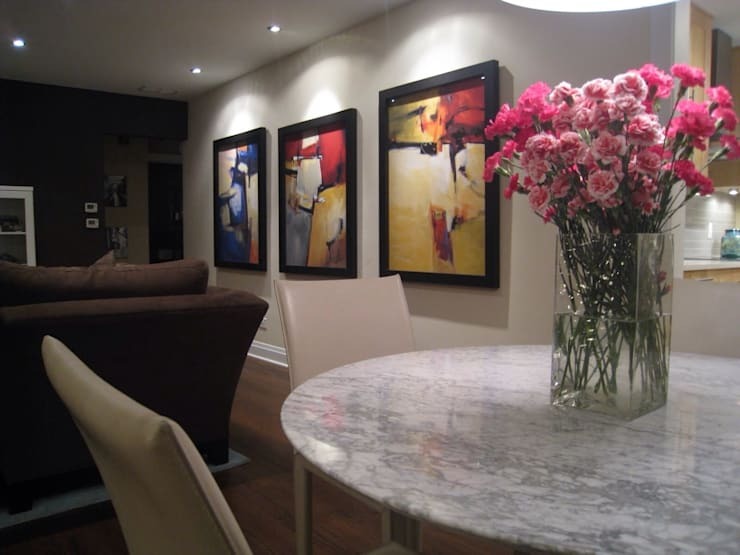 Remember to opt for sleek designs so that it does not distract an observer’s vision from the paintings. Thoughtful lighting also brings out the richness of the hues, textures and strokes of a piece of art and adds depth to it. Like everything else in the realms of home decoration or fashion, your art display can reach an all time high with a mix and match concept. Different sizes of framed art in both square and rectangular versions can be put together on the same wall for a stunning effect. Their dissimilarities can invoke a special interest in your guests too. Like sizes, different styles can also be flaunted together. For instance, a heady mix of traditional and postmodern paintings can make even a simply adorned living area appear to be exotic. Get inspired by this gorgeous living room designed by Stefano Tordiglione Design Ltd., architects from Italy. The paintings featured on the wall exhibit varying colour palettes, distinct ideas and connotations. But together, they weave magic! Wooden parquet flooring and earthy furnishing provide a luxurious balance to the artworks. A healthy distance needs to be maintained between your wall of art and the furniture in your living room. Why? Because only then can the complete beauty of the paintings blossom unhindered! The spacious predominantly white living room pictured above is a fine example of this notion. An interesting collection of framed art has been displayed on the wall between the two almost floor to ceiling bookcases. Note how the artworks have been arranged quite a bit above the sleek wooden table between the white couch and the old-fashioned armchair. This allows a clear line of vision for the art display when someone enters the room. 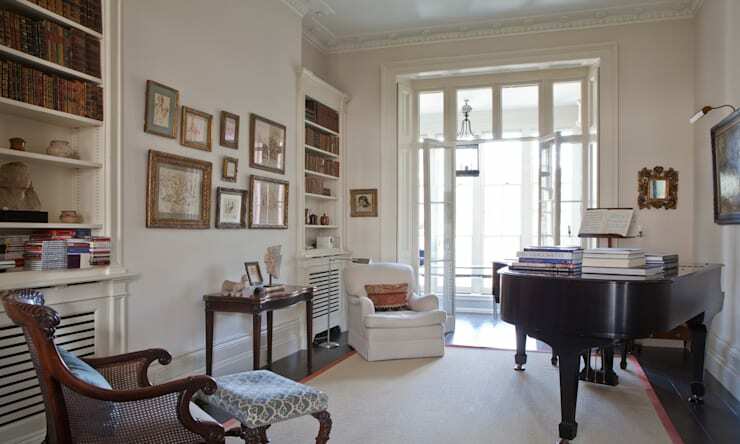 The couch and the armchair also lie much away from the wall devoted to art, and are rather closer to the bookshelves. This way you can laze in them, reach out for your favourite book and still admire the paintings comfortably. Although current trends celebrate the collective display of different kinds of painting, maintaining a consistent or harmonised colour palette can be refreshing too. For instance, observe how the monochromatic paintings of the Eiffel Tower have added a sense of order and symmetry to the room above. Similarly, you can try bringing together artworks which flaunt same or related hues for a uniform look. This idea especially works well in living areas which are of a more formal nature. The colour of your living room walls has a major role to play when you are contemplating about which paintings to hang. The tone of the frames is particularly vital. And the theme, style or colours used in the artworks should also go well with the overall look and feel of your living room. Check out the quirky and cheerful living space shown above for inspiration. The dark frames provide the right contrast against the light-coloured wall and the white decorative moose’s head. 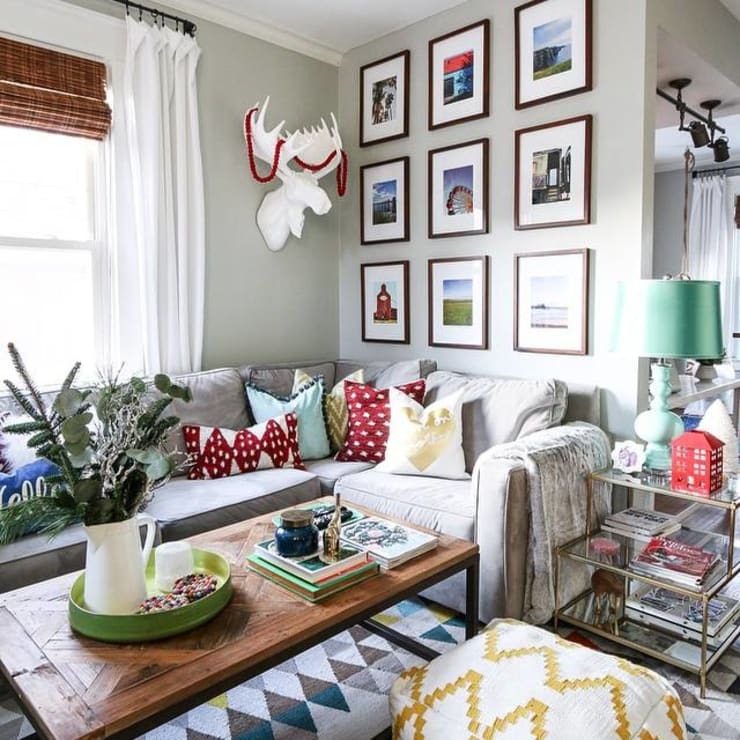 Look a little closely and you will notice that the overall painting palette goes nicely with the bright cushions, the lampshade, the potted indoor plant, the geometrically patterned rug and the fun ottoman. Since everything else in the room exudes a slightly eccentric vibe, the paintings are of the same size and have been arranged symmetrically to lend method to madness. The days of arranging wall art in a strict, specific order are long over. Since you can use paintings of different sizes together, there’s no need to stick to only rectangular or square layouts. The tops, bottoms and sides of adjacent paintings don’t have to follow a single straight line anymore. Take a look at the living room pictured above to come up with ideas. If you desire to devote more than one wall to paintings, then you can experiment with different layouts on the different walls too. Just make sure they look good together. Mix vertically rectangular artworks with horizontally rectangular or square ones with élan. They can be arranged in a pyramidal or circular layout, or you can make them mimic an ascending or descending staircase! Once you keep the above tips in mind, putting together an art gallery in your living room will be a piece of cake! Finally, don’t lose focus of your personal taste and preference. That is what will truly make your display stand out from the rest. Here is another ideabook to get your creative juices flowing – Wall art to spruce up your home. Are you a big art fan? Do you fancy having a gallery in your living room? Let us know in the comments!